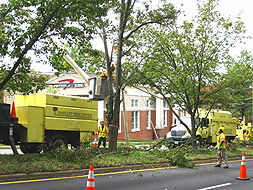 McLean, VA (October 2013) – Bartlett Tree Experts, Area Wide Protective (AWP), and the Virginia Department of Transportation (VDOT) together donated services to the McLean Trees Foundation (MTF) for removal of dead or dying Bradford Pear trees on the Dolley Madison Boulevard median, between Elm Street and Beverly Road. Bartlett Tree Experts is a family-owned, international company that provides scientific tree and shrub care services locally out of their office in Springfield. Area Wide Protective is America's Traffic Control Leader, providing safe, reliable, and cost-effective solutions to utilities and contractors throughout the Eastern United States. "The Dolley Madison Boulevard pear tree project, facilitated by the McLean Trees Foundation, is an excellent example of a public-private partnership that benefits the entire community," said Joyce Harris, Chairman of the McLean Trees Foundation. Of the 113 Bradford Pear trees that were originally planted in 1972, forty trees remain on the Dolley Madison Boulevard median today, but are in poor health, according to the McLean Trees Foundation. The median, one of the major corridors in McLean, is often littered with downed tree limbs. A crew from Bartlett Tree Experts removed 10 trees that were dead or that showed significant dieback. Additionally, the crew removed large dead branches from some of the trees to help reduce the risk of falling limbs. The work was conducted during a five-hour period and involved lane closures in both directions on Dolley Madison Boulevard. Wood chips generated from the pear trees were then distributed to create mulch paths for the Chesterbrook Living Classroom on Kirby Road in McLean. Sponsored by the City of Falls Church Water Utility, the Chesterbrook Living Classroom is an environmental project designed to promote a healthy watershed and reduce the effects of stormwater runoff. The Living Classroom is maintained with the assistance of the Fairfax County Restoration Project and Lands and Waters, Inc. Elementary students from the City of Falls Church and Fairfax County have access to the site as an outdoor lab for observing, analyzing, and enhancing ecosystems, plants, and wildlife. "We are grateful to Bartlett Tree Experts for making the Dolley Madison Boulevard pear tree project possible and for their guidance on tree care," said Harris. "AWP and VDOT, who assisted Bartlett by donating traffic control services, did an outstanding job of managing traffic under challenging conditions. Furthermore, the wood chips from this project have now been put to good use on a site designed for stormwater control." Commercially released in the early 1960s, the Bradford pear, Pyrus calleryana 'Bradford', is a thornless, ornamental pear tree native to China and Korea that was developed in the late 1950s by the U.S. Department of Agriculture. It was initially very popular because of its fast growth, white flowers in the spring, and conical shape. As suburban development exploded in the 1960s, many communities, including McLean, used it as a favorite street tree. However, the trees have a short life-span and don't age well. As the tree matures, the trunks and branches start to break apart. "Bradford pear trees look pretty in the springtime when they are flowering, however, they have a tendency to split apart due to their brittle wood, poor branching structure, and weak crotches," said Stewart Bunn, a certified arborist for Bartlett Tree Experts and former Virginia Tech Extension Agent for Fairfax County from 1977-1986. "In this case, as the trees aged, branches littered the roadway and became a potential safety hazard to the cars passing through this section of McLean. The work completed helps maintain their safety for residents and visitors." "Projects like the one on Dolley Madison Boulevard not only bring people together, but they also educate and inform the community," said Ellen Vogel, Northern Region Landscape Architect for VDOT, who assisted MTF. "We are glad that we could help move this project forward." "Sometimes tree care involves significant safety concerns, and in those cases, it is important to rely on professional services," said Harris. "As an organization, safety is at the center of everything AWP does. We have numerous jobs in this area and we welcomed the opportunity to give back, especially in a way that improves the safety of this community," said Dan Bertke, Manager of Estimating and Contracts for AWP. "Bartlett Tree Experts has been providing scientific tree care for over a hundred years and giving back to the community is one way we demonstrate our passion for trees," said Stewart Bunn. "This project is good for the community. All landscape projects benefit from proper planning, tree selection, regular pruning and maintenance beginning immediately after planting." The McLean Trees Foundation was founded over 43 years ago as a semi-autonomous committee of the McLean Citizens Association before incorporating in 2004 as a 501(c)(3) tax-exempt, non-profit organization. MTF's mission is to preserve, plant, and maintain trees in McLean; to educate the public about benefits of trees; and to assist residents in taking an active role in caring for trees in McLean. Fill out the form below to send an email to Joyce Harris. Click on the Send button when you are ready. All fields are required.